I don’t know what it was advertising but WOW. As I drove, and since, I’ve really been really thinking about that question. But I submit that most people are telling a lie, not just to others but to themselves. In real estate, we see home buyers who have found a home that is as perfect as possible (since nothing is 100% perfect) but just can’t emotionally commit to buying. We see sellers, with their lives on hold until they can sell a house, who won’t admit the emotional ties that lead them to make counter-offers they know will be rejected. I run across real estate agents who blame the economy, the competitors, their broker, the buyers, and the sellers for their woes, yet never seize opportunities to gain market share, find a better brokerage, or teach themselves new skills. Not improving your life is easy. It feels comfortable and comfortable feels safe (even when it often not). I know people of all walks of life who claim they want something better, something new, some opportunity. Some even tell me they pray for blessings and opportunities for themselves or their family. But opportunities involve change, and change is uncomfortable (even painful) to people no matter how much they dream of a better life. When presented with an opportunity, I believe some people actually wish or pray for the pain of change to go away more than they seek strength to overcome their self-created discomfort. For many, their answered prayers are not progress, it is removal of fear by their rejection of opportunities. 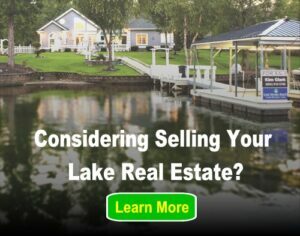 I like to think I embrace opportunities instead of hiding from them, such as the opportunity of growing Lake Homes Realty as a business. It has required me to emotionally and professionally grow, to endure the pain of lessons learned, to fail in front of others and get up and do better. It takes a steady, conscious effort. I find I must be diligent to seek the right paths of opportunity, and avoid the twin gutters of false security and blind entrepreneurialism. If you could improve your life, would you really do it? Or would you stay where you are, finding ways to believe and embrace your fears? These are tough questions. We should ask them everyday. Twice the adventure! Buying and selling a home at the same time!